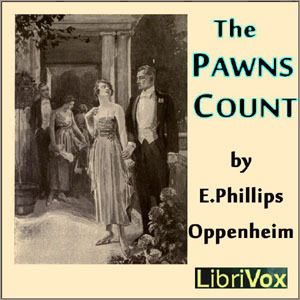 E. Phillips Oppenheim, an English novelist created well in excess of 100 novels and 30 plus collections of short stories. Most of his tales are thrillers and espionage. About the Pawn’s Count…. “I am for England and England only,” John Lutchester, the Englishman, asserted. “I am for Japan and Japan only,” Nikasti, the Jap, insisted. “I am for Germany first and America afterwards,” Oscar Fischer, the German-American pronounced. “I am for America first, America only, America always,” Pamela Van Tale, the American girl, declared. They were all right except the German-American. It is during World War I. A chemist, Sandy Graham, has discovered a new powerful explosive, but he let’s it slip in a London restaurant that he has made the discovery. Graham is ready to join some friends for luncheon at the restaurant but chooses to clean up before joining them. He never comes out of the restroom. Several spies from different governments set out to find him and the formula.